, originally uploaded by Mudstone. I just notice that mudstone added an assortment of amazing photos taken of the ProdMod LED hoop. I like this one in particular. 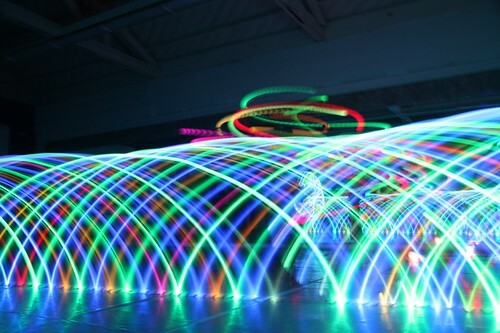 It looks like the hoop was rolled on the floor and taken with a long exposure setting of the camera. It’s great how you can see each LED as it approaches an touches the ground. Wow. I love it. It also reminds me how bright the ProdMod hoop lights are. If you have some cool pics of your ProdMod hoop you would like to share please add them to the ProdMod Flickr Pool. In fact I am inspired to have a contest! 2. Add your best pics of your ProdMod hoop in action between now and Nov 7th. 3. Make sure you refer to it being a ProdMod hoop in either the title or the description of that photo. 4. Tag the photo with the term “prodmod” and “ledhoop”. $40 credit to anything sold on my site*. *This does not include hoop kits as they are sold through makershed.com.